Have you carried the stress of 2017 into 2018 with you? Our Chiropactor says stress can REALLY impact our physical and mental health – so let us help you make reducing stress a priority! Most of us carry our stress in our neck and shoulders. Our muscles in those areas tighten up, and remain tense when we’re busy trying to juggle the million things we want to get done everyday. The back of the neck and shoulders can really start to feel stiff and painful. Stress can cause headaches, digestion problems and general fatigue. Stress also has a negative impact on our mental health. It causes anxiety, irritability and can even start to interfere with our concentration. Eliminating stress is impossible – but how can we manage it? One simple way to help combat stress is diaphragmatic breathing. Committing to 20 minutes of mindful breathing every day can really help alleviate the negative impact of stress. 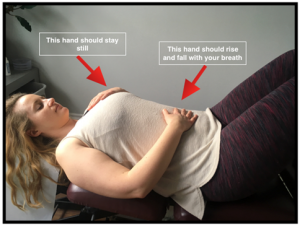 Diaphragmatic breathing has been proven to reduce muscle tension, improve mood, improve our memory and even reduce cortisol levels (our stress hormone!). Taking the time to breathe through our bellies activates our ‘relaxation response’ and dampens our ‘stress response’. Lay on your back, knees bent up and eyes closed. Turn your phone OFF. No distractions! Place one hand on your chest, the other hand on your stomach. Take a slow, deep breath in. Let your stomach expand as you inhale – the hand on your chest should not move at all! Purse your lips slightly and exhale, make it last longer than your inhale. That hand on your chest should not move – ever – at all – not even a little. Are you thinking to yourself that you don’t have time for this? Yes you do. Make your health a priority – even if it means going to bed a few minutes earlier and concentrating on your breathing. When stress gets out of control it can contribute to much more serious issues like high blood pressure and heart disease! Make a point to prevent your stress from causing you these problems in the future. Take the time to take care of yourself – and just breathe.